The HDD installation required more than 1,500 feet of 30-inch zinc-coated AMERICAN ductile iron pipe. 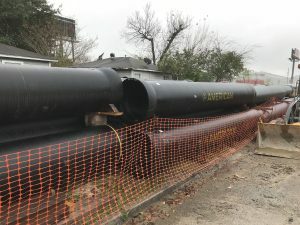 According to North Houston Pole Line Vice President Harl Sims, ductile iron pipe worked "flawlessly" in this application. This story also appeared in the August issue of Trenchless Technology. The first horizontal directional drilling (HDD) installation of AMERICAN ductile iron pipe for a cable conduit was completed in Houston, Texas, at the end of 2017. The project was conducted for a large utility company and required moving power cables from aboveground to underground. 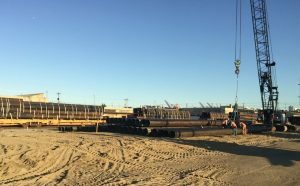 The HDD installation required more than 1,500 feet of 30-inch zinc-coated AMERICAN ductile iron pipe. One challenge of the project was tight spacing for the installation, as it occurred in a two-lane residential area. 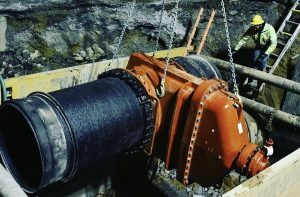 The bore and installation equipment were located on one side of the road, and the 20-foot sections of ductile iron pipe were staged on the other side. Each pipe joint was snapped in and then pulled through with the boring machine. With HDD, pipe joints are assembled aboveground and then pulled through a hole drilled under natural and manmade obstacles. With HDD, pipe joints are assembled aboveground and then pulled through a hole drilled under natural and manmade obstacles. 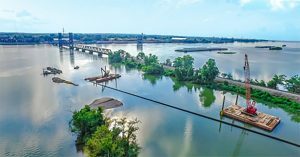 HDD allows for environmentally friendly pipe installation under wetlands, rivers, creeks, highways, railroad tracks, buildings and other obstacles. HDD also minimizes surface interruptions, reducing negative impacts to traffic and businesses during construction. The general contractor was North Houston Pole Line, and subcontractors for the boring portion of the project were Ranger Directional and Mears. All are a part of Quanta Services Company. Ferguson Waterworks – Humble, Texas, was the distributor for the project. One challenge of the project was tight spacing for the installation, as it occurred in a two-lane residential area. 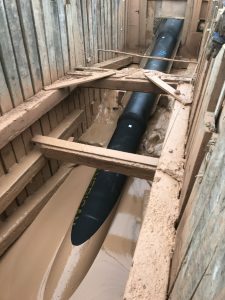 The 20-foot sections of ductile iron pipe were staged on one side of the road, and the bore and installation equipment were located on the other side. Sims said before the project began, everyone was a little leery of ductile iron pipe’s use in this application. Once things got started, however, everyone’s opinion quickly changed. The North Houston Pole Line Team consisted of Sims, Construction Manager John Mizell and General Foreman Jeff Gasen. The Ranger Directional Team consisted of Vice President Alan Goins, Construction Manager Chris Lopez and General Foreman Tim Howard. The Mears Team consisted of Vice President Jason Steph and Operations Director Steve Meaders.